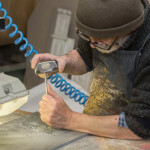 This process is carried out according to ancient, traditional techniques creating a rest over which the work is then made. In the past, the rest consisted of a reed structure or a wooden board on which a rough hemp cloth was laid in order to obtain a grid for holding the different layers of plaster. Once the plaster hardened, it was taken off the grid and had to be dried for roughly a month. Today, all these steps can be replaced by the use of slabs of slate or different marbles. 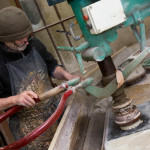 Once a rest is obtained, the pattern must be transferred on the slab; this is the most properly artistic stage of the process, also called “spolvero” (pouncing). 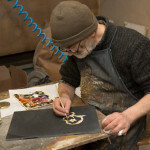 Subsequently the pattern is engraved with little chisels; the holes thus obtained are then filled up with a mixture of glues, plasters and soils known as “scagliola”. The ductility of this mixture allows the craftman to express his feeling and professionality through nuances, movements and colours. 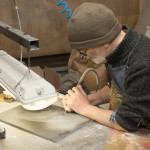 The following step is the pumice polishing done both by hands and with the use of special machines. 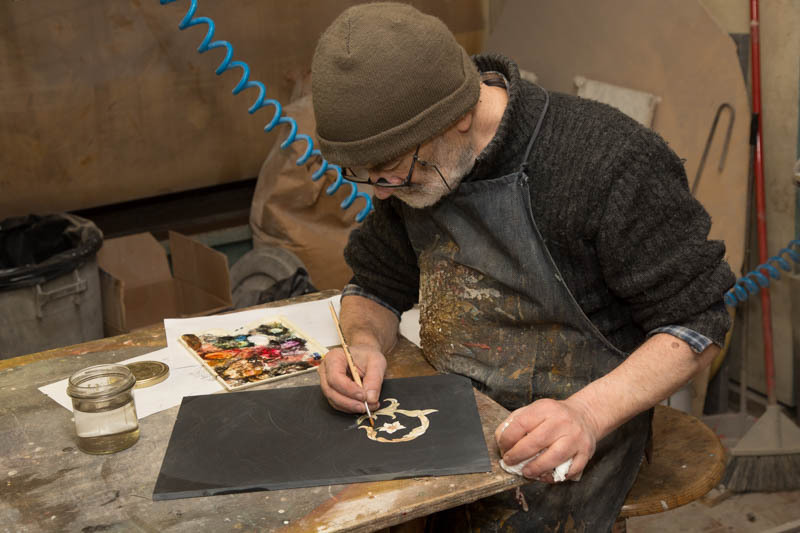 The result so far obtained is remarkable but a stroke of the brush or a graffito scratch by the artist lends the scagliola work the sort of plasticity of movements which renders it unique. 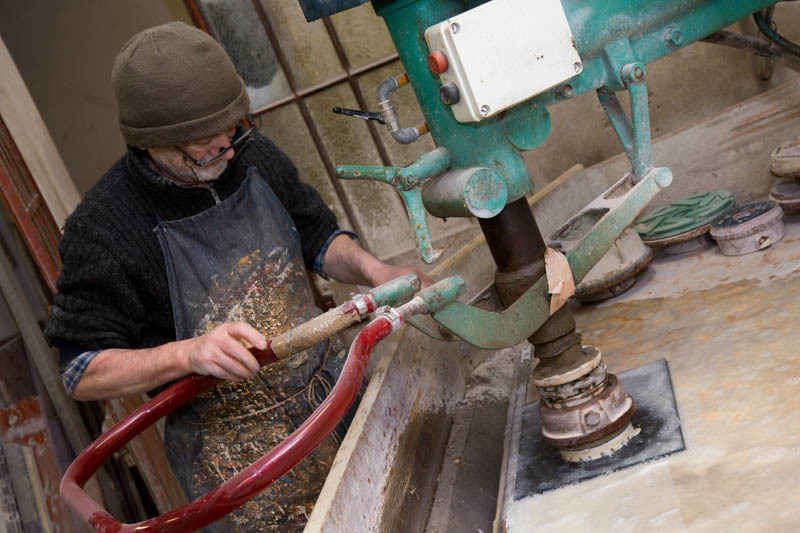 The “scagliola” technique which implies the use of materials such as plaster, natural glues, coloured soil, has always been used in works related to the field of building thanks to its ductility and plasticity. As a form of art, it originated in the Tirol area and in Bavaria, but it is in Italy, particularly in Carpi (Emilia Romagna), that it acquired a more specific style. 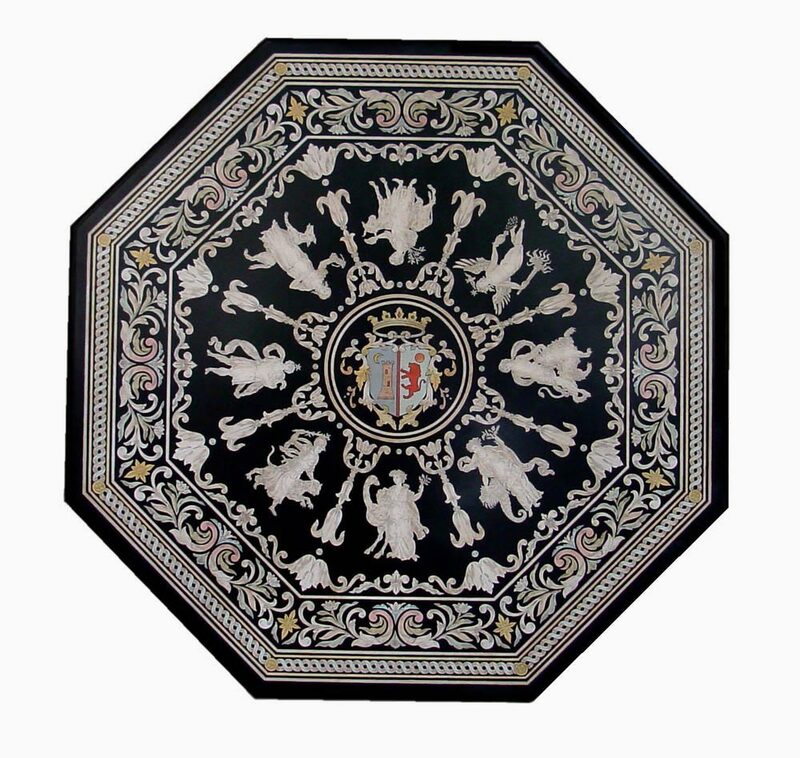 Scagliola can also be considered as a sort of imitation of marble intarsia, although it is not so expensive. The Emilia Romagna Appennino mountains are rich in plaster minerals but not in precious marbles. Nevertheless, the results obtained were so impressive that many churches and rich families wanted to have altar reredos, tables, small pictures done in this technique. Several comparisons could be made with wooden tarsia works since the two forms of art are very similar. Around 1600, several panels and tables were realised in the the Tirol and Germany, the Reiche Kapelle in Munich is an example. 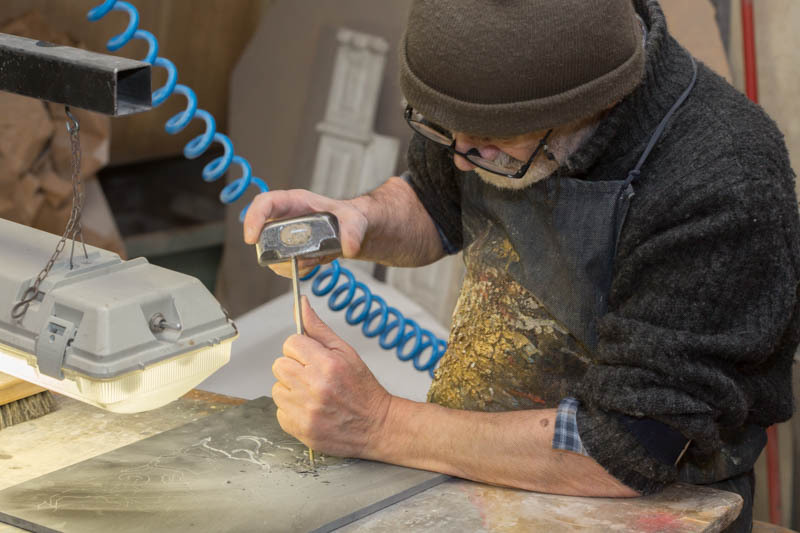 In Italy, it was Guido Fassi who started doing a few works for churches in Carpi. Only at the end of XVII century, was there an artistic development thanks to Gibertoni and Grifoni. Further scagliola works were carried out in the Marche, Lombardy and Tuscany regions. In the XVIII century Tuscany hosted a group of scagliola workers around the figure of the vallombrosano monk, Abbot Hugford. 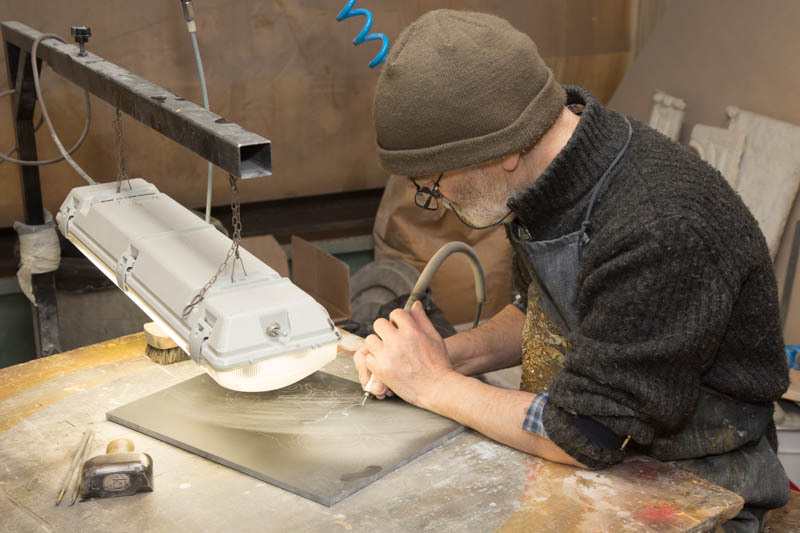 Therefore, while in Emilia Romagna, the clients for scagliola works became fewer and fewer, in Tuscany many works were done also in order to satisfy the requests by French and, especially, English travellers, who came to Italy for their Grand Tours. The success of Tuscan scagliola workers is also explained with the protection that the Grand Duke Pietro Leopoldo granted them. After a period of time during which the use of the scagliola technique in furnishings and decorations was almost forgotten, it a was E. Martelli who gave birth to a new revival of this form of art. 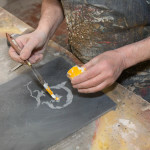 The decorative works done in our premises today, are done according to the oldest and most special scagliola techniques. 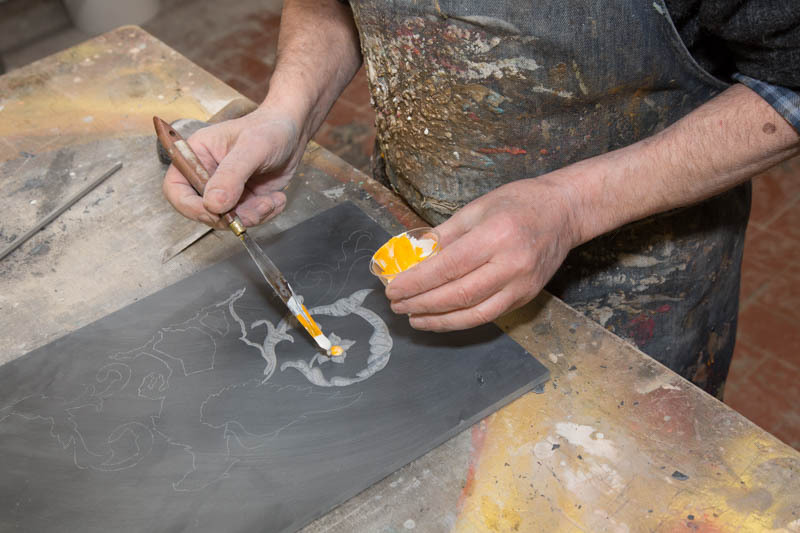 Our table tops, small pictures and wall panels reflect the young craftsmen’s passion for this centuries-old form of art which they learn following the guidance of expert masters. "While there is evidence of scagliola decoration in ancient Roman architecture, scagliola decoration became popular in Italian Baroque buildings in the 17th century, and was imitated throughout Europe until the 19th century."